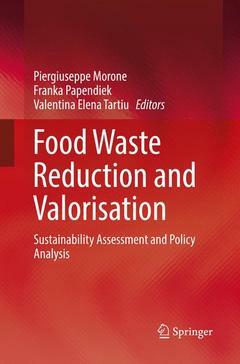 The book explores the development of regulations and policies for food-waste prevention, management, and valorisation at a global as well as European Union level. It also discusses the notion of food waste in legal terms and investigates the effects of the lack of a standard, universal definition of food waste on the efficient use of by-products, promising processes and products for technological and commercial exploitation. Utilising mathematical mapping methods to assess food consumption impacts and providing supply chain models that allow the testing of consumption scenarios, the book goes on to discuss a series of emerging technologies (tested at lab scale and/ or pilot scale) and opportunities for the valorisation of food waste. Introduction.- Cutting through the challenge of improving the consumer experience of foods by enabling the preparation of sustainable meals and the reduction of food waste.- The Economic Case for the Circular Economy: From Food Waste to Resource.- Decreasing greenhouse gas emissions of meat products through food waste reduction. A framework for a sustainability assessment approach.- Fodder Legumes for Green Biorefineries: A Perspective for Sustainable Agricultural Production Systems.- Bio-waste lignin to soluble lignin-like polymers. An Italian municipal waste treatment plant as empirical case study for evaluating processes and applications for technological scale up and commercial exploitation.- Techno-economic study and environmental assessment of food waste based biorefinery.- Techno-economic evaluation of refining of food supply chain wastes for the production of chemicals and biopolymers.- Bio-based Economy: Policy Framework and Foresight Thinking.- Bringing a Sharing Economy Approach into the Food Sector: The Potential of Food Sharing for Reducing Food Waste.- Defining the Meaning of Food Waste as a Matter of Urgency.- Waste Reduction in Fresh Food Supply Chains: an Operations Research Approach.- Participatory Planning in Organic Solid Waste Management: A Backcasting Approach.- The role of social networks in the diffusion of bio-waste products: the case of mulching films derived from organic waste in Province of Foggia.- Grassroots innovations and the transition towards sustainability: Tackling the food waste challenge. Editors and contributors work at the interface between innovation, agricultural economics, engineering and chemistry, studying from various perspectives innovative waste valorisation activities for sustainability transition to a biobased economy.